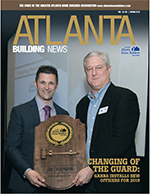 Atlanta Building News provides both a quarterly magazine and weekly e-newsletter update for GAHBA members. Each issue’s content is intended to keep members informed on topics important to the home building industry and recent happenings at the GAHBA. Advertising opportunities are available in Atlanta Building News for both members and non-members. GAHBA members receive a discount on ad rates. Advertising in a GAHBA publication does not denote or imply promotion or endorsement of any product, service or company by the association. It is the editorial policy of the GAHBA neither to accept unsolicited content from third parties nor to engage in advertorial style placements. Atlanta Building News does not run press releases unless they are related to current members’ industry awards, honors or recognition. Non-member information is not published in Atlanta Building News. Articles supplied by GAHBA members should be educational in nature and should not promote a company, product or service. The editor’s acceptance of an article is not a guarantee of publication in Atlanta Building News.